The Russia World Cup 2018 is here! Are you looking forward to the next matches, counting the days and hours before you can cheer for your favorite team again? Our calorie calculator is created specifically for this exciting time. Thanks to this great tool, you can calculate how many calories you gain while watching a football match, drinking a beer, and munching on snacks. Find out for how long you need to exercise to lose those extra kilos gained after World Cup. In energy_intake, we add all the snacks and beer you consume while watching football games, taking the average calorie values for the chosen snack. Enter your weight. We'll assume 80 kg (you can change it to pounds by clicking on the unit). Type the number of the events you will have watched. Let's say that you are watching how your national team is coming through all stages - group (3 matches), round of 16 match, quarter- and semi- final and the World Cup final. This sums up to 7 matches. Enter the beers and snacks you consume per one game. We don't believe that you aren't drinking anything! During the exciting matches, two bottles of beer are disappearing in no time. As well as a bag of chips. Definitely not the serving portion which is 10 chips or so. Aaand not the smallest bag. What about the large one? Yes, that's more like it. Ooops. It looks like that you gained almost 8350 calories, which is more than 1 kg! Football calorie calculator displays time needed to burn extra weight. It's 14 hours in 11 minutes of recreational football. Urgh. Hey buddy, put this one beer bottle back to the fridge! 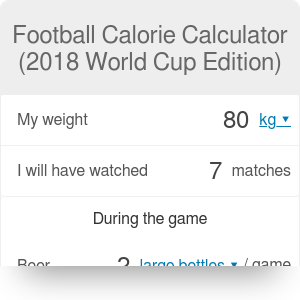 Football Calorie Calculator (2018 World Cup Edition) can be embedded on your website to enrich the content you wrote and make it easier for your visitors to understand your message.